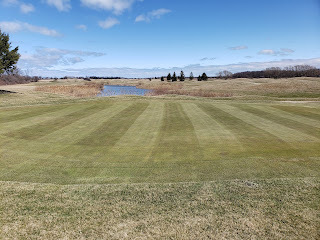 The 2019 golf season is now underway!. Following a warm morning shower on opening day, we were blessed with a couple of nice days of warmth and sunshine to kick it off. With a handful of days where we hit double digit highs and plenty of sunshine, our short turf areas exploded. Never before have I observed such colour and vibrancy from our putting surfaces this early. In fact there have been years' where we are begging for the slightest shade of green 5 weeks from now! The colour certainly is nice but truth be told we still have a ways to go to achieve our desired ball roll consistency. You may have noticed a return of all ball washers to the course to start the year. After a one year hiatus, they have made their return for the 2019 season. Please bear with us as we attempt to resolve leakage issues on these aged units - some are struggling to hold their seal. Tee blocks are all out on the course and you will notice that some aren't quite pushed back into their normal positions. It is imperative during the shoulder season that we not utilize prime tee block positions in an effort to conserve quality turf. 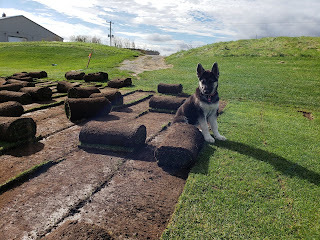 Some blocks may be blended with others while some (such as the black tees on 6 and 7) will be up for a few weeks until we start to see regular growth. Keep in mind that the method to our madness is turf health and sustained play-ability as we brace these small surfaces for the next 200 days of traffic. 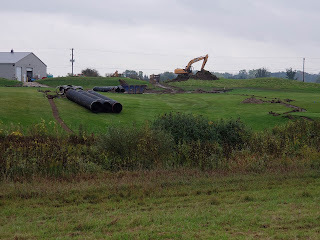 The cleanup of the creek project as well as the municpal drain project from the fall continues. We have struggled to move some of the gigantic chunks left behind from the creek (with some still containing blocks of ice as of late last week) and have had to enlist help with its cleanup. As for the municipal drain, the settling that took place over the winter is fairly significant. We have our hands full in bringing it back to life. Finally, with some of our staff trickling back in, make sure to give them a smile and a wave. It's always nice to see these fine men and women return each year and perform the magic that they do. We are still a few weeks away from being fully staffed but should be there around the second week of May. After initiating a conversation many years ago with the Town of Plympton-Wyoming, this past week has finally brought about some progress on the state of Errol (Sawmill) Creek, and the condition of the waterway. Although it is not 100% complete and not looking like it will be completed at this very moment, there has been significant cleanup and dredging completed of the creek. As you can see there is a dramatic difference in the state of the creek. 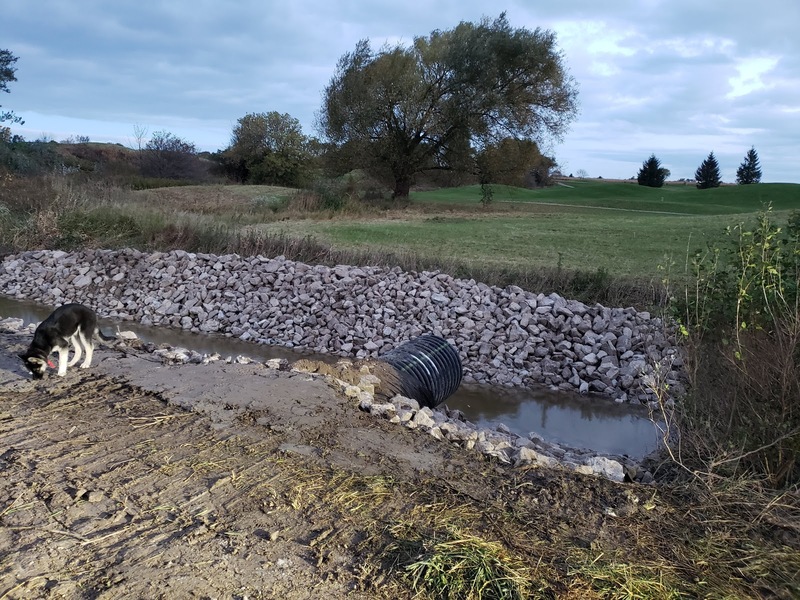 The brush has been removed and the creek should now flow in sections without any barriers. The project itself is not complete. 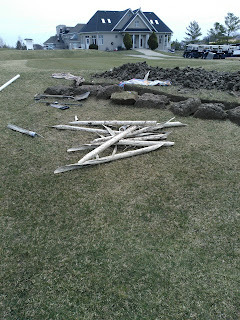 We have our share of material to remove - both brush and soil. Weather will make this tricky over the next couple of weeks, as we begin the spring thaw. Attempts to move the soil today were futile, as the chunks of soil are still frozen solid. Of course once it thaws, the surrounding area will also thaw, making it difficult to cleanup without making a bigger mess. Patience will be key here as we make efforts to put everything back together. 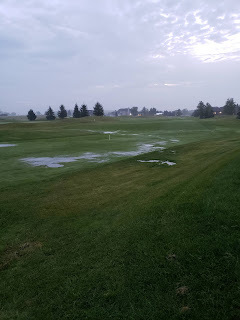 Nonetheless, we should see a vast improvement with the way water moves and drains off of the course. 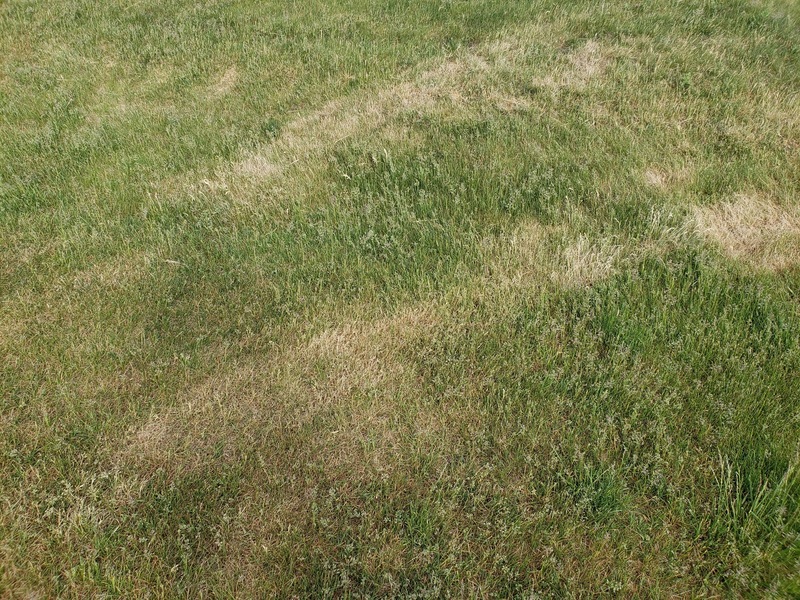 There is a lot of unknowns when it comes to turfgrass management. A million questions sometimes without any answers at all. 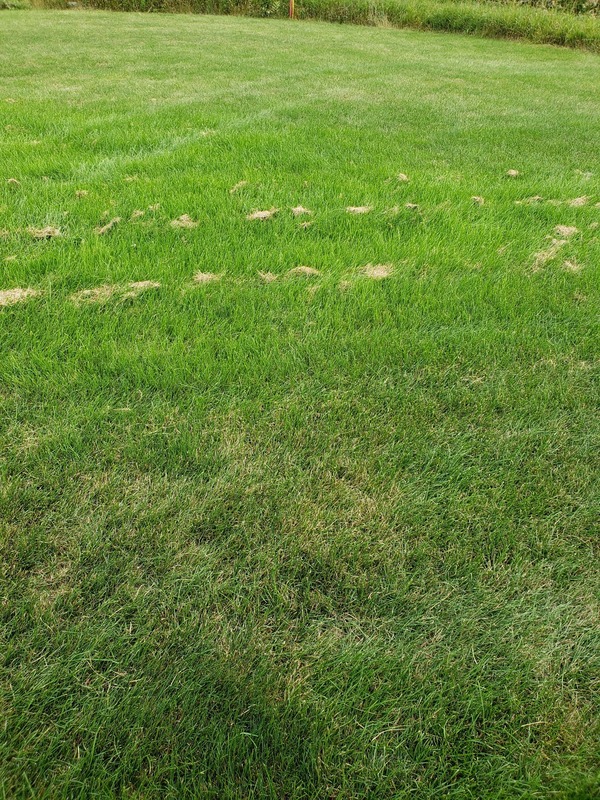 It can be beautiful and infuriating all at the same time while we try as turf managers to control the uncontrollable. 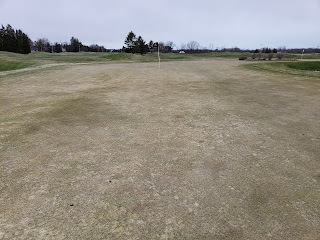 That is quite the week we just experienced - we hit an actual low of -24 degrees C and a high of 9 degrees C.
So what is that 33 degree swing doing to the turf? That is a great question that I really can't provide an accurate answer to. 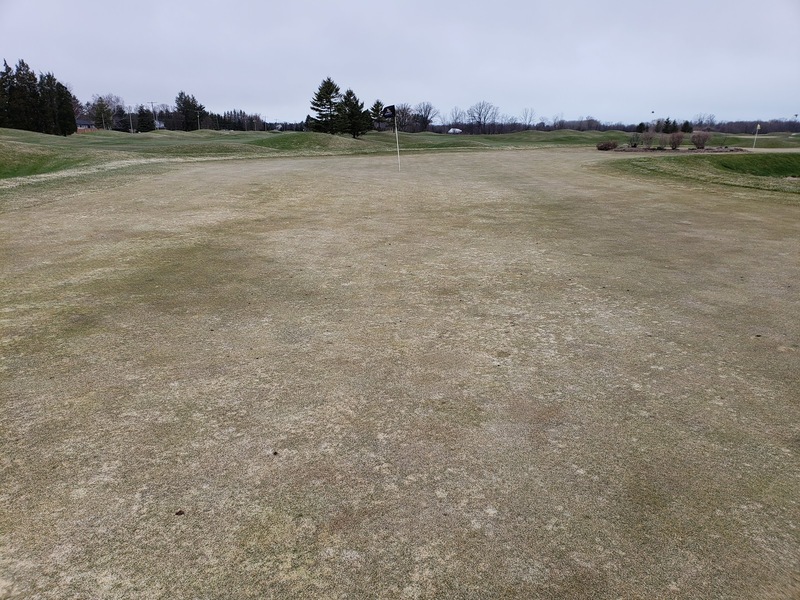 With so many factors playing into turf health (moisture, crown exposure to those frigid temperatures, etc) it would be tough to even make an educated guess as to what the future holds for our turf. But we remember times like these when dormancy breaks as possible contributing factors to turf growth. We continue to prepare for the upcoming season in the Turf Department. A fresh coat of paint, wood refinishing and equipment maintenance has all been at the forefront of our daily task lists as we ready ourselves for the next season. I believe in one of these posts I proclaimed that our foot comes off of the gas pedal once the calendar flips to October. This step was extremely labour intensive as we prepared for the install. Conditions were wet at the time, making all 1200 rolls extremely heavy. The secondary problem was with the warm temperatures, we needed to roll out each roll knowing that it would be on the ground for approximately 9 days. 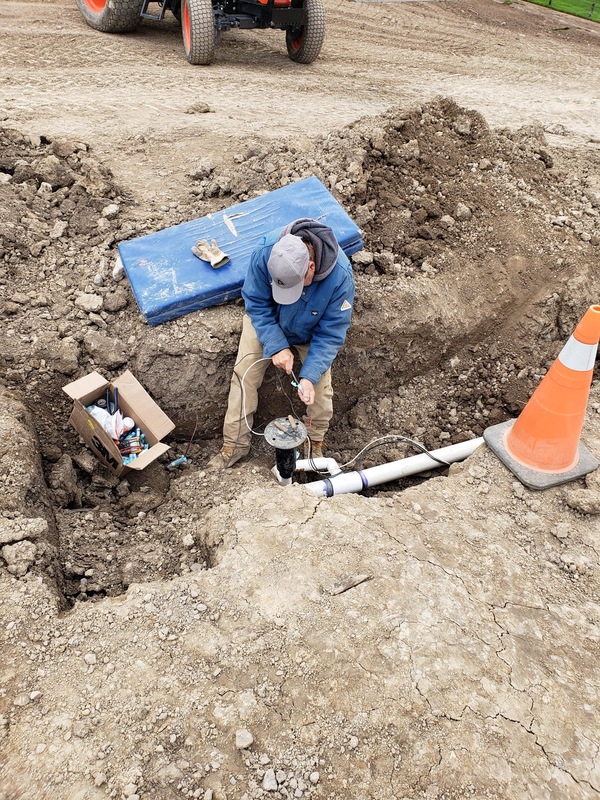 We followed this by having to disconnect the three main lines, and our main power line to the irrigation system. 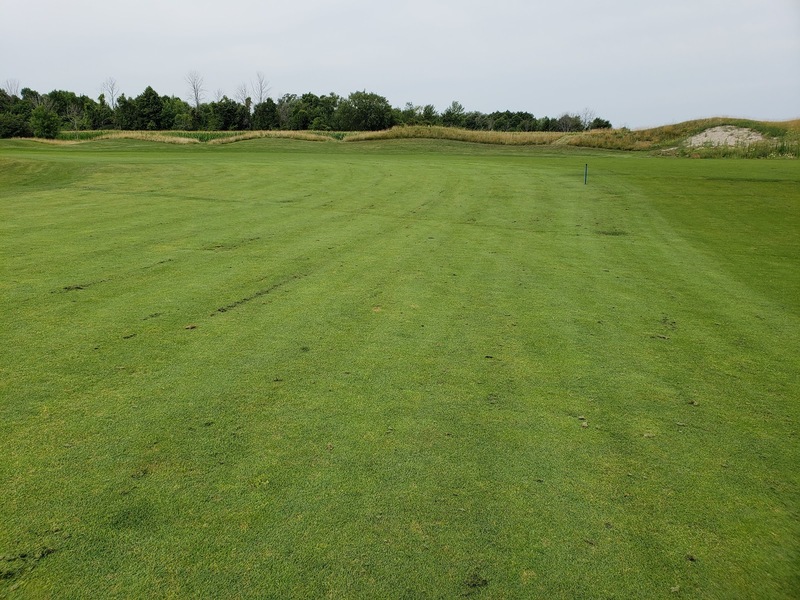 We had to remove sprinkler heads, and pre-cut all of the lines to prevent further damage when the big machinery arrived. The day the contractor was to move in, it rained....hard. Nothing new for 2018, but certainly not welcomed. Once the contractor moved in on October 2nd, the installation of the 30 inch line commenced with some very deep holes! 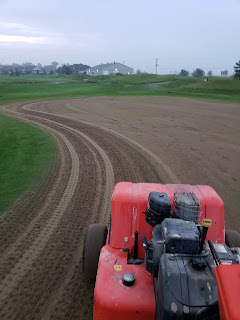 The contractor was very clean during this process, and despite the extended time needed, they were very gentle on the course. 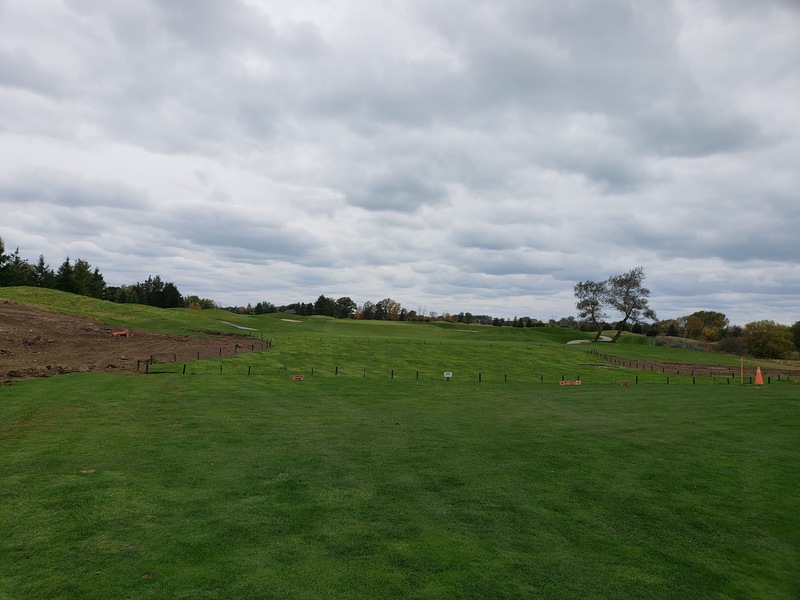 Unfortunately, during this extended period of time, we still had to care for the fairway sod that had been removed. 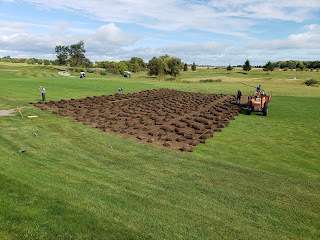 Of course the temperatures soared and with a little bit of rain all 1200 rolls decided to root to the field it was laying in. 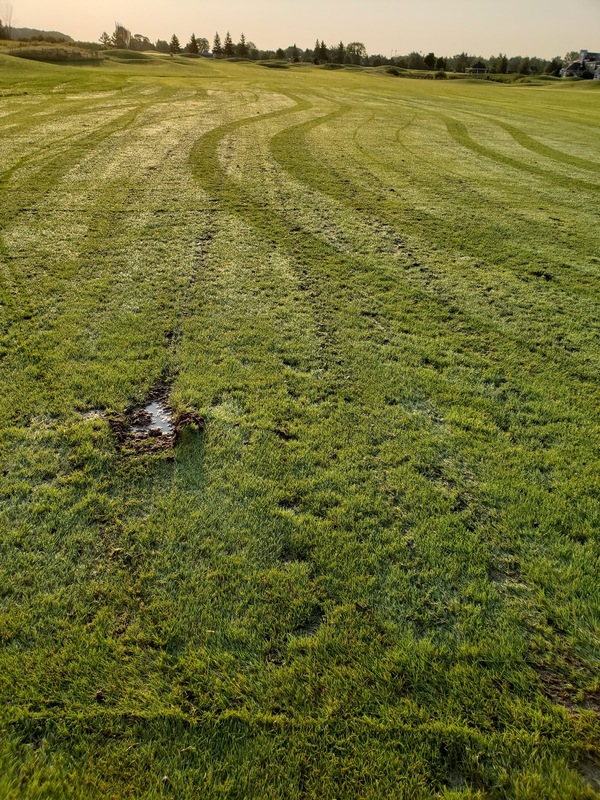 In what may have been the worst day of his life, Jake spent 8 hours pulling up on semi-rooted sod making sure that we would be able to get it back to its home base when needed. 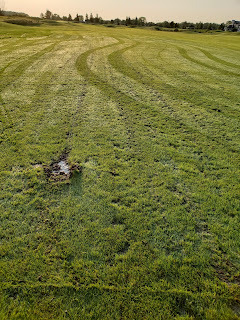 An absolute awful job to hand out, but one which ensured that we would be able to re-use our turf. 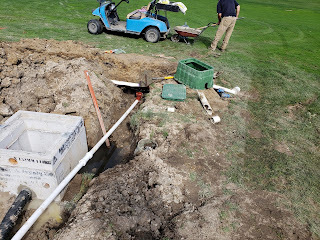 Meanwhile, as the contractor was trying to get off of the golf course, we had to work around them in an attempt to get our irrigation system back together. In what can only be hailed as meticulous planning prior to the job, Claude managed to put everything back together with nary an issue at all. 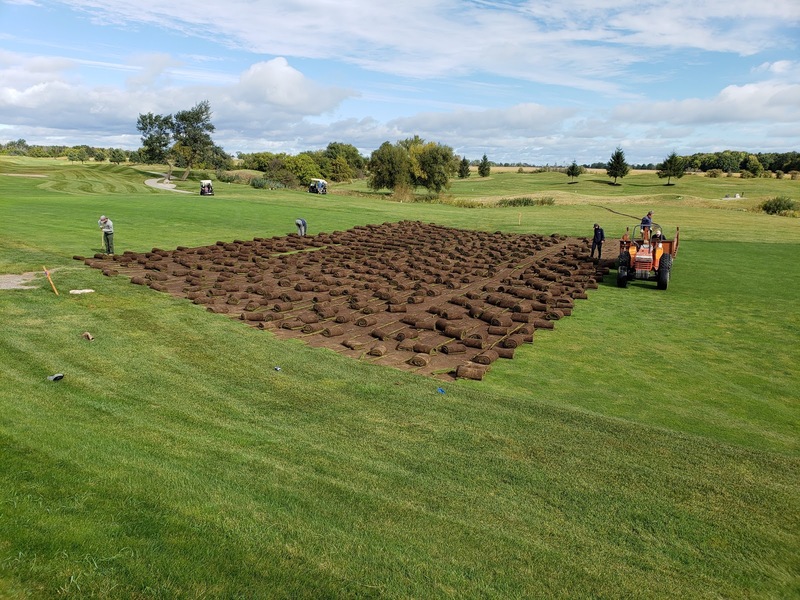 This was no small task; anticipating all materials needed, following less than accurate maps and a nightmare of working around both turf and outside contractors. This could have been a nightmare, but instead turned out perfectly - well done Claude. What was most amazing out of the project was the cleaning out of the outlet of this drain in Errol Creek. 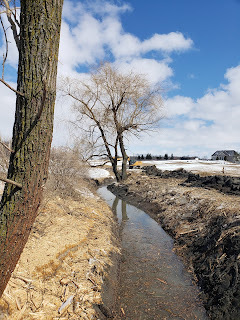 It had been discussed many years ago about the prospect of the Town cleaning out the creek on our property and bringing it back to its original depth. As a part of this current project, the contractor had to ensure the outlet was clean....and clean it now is. I lost count of the number of dump trucks that were needed to remove the material in this small area, but it was incredible. It is now clear to see just how overgrown this waterway has become. Fortunately, the engineer responsible for this project called in the Town to view the severity of our creek. Upon inspection, they agreed; something needs to be done. We have now received commitment from the Town to begin work in January on cleaning out the creek! Lena, Shelley, Dan, and Jake slugged it out entirely today, managing to get the fairway back together. It was a long day, but they knocked it out of the park. Meanwhile over the last two weeks we have taken advantage of sporadic course closures and performed our annual greens aeration. 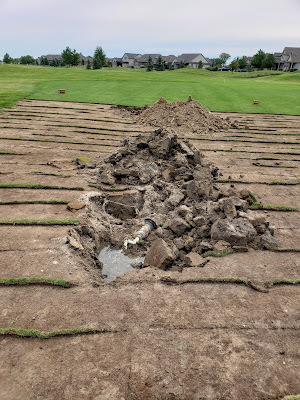 With my time and energy being spent on the drainage project, I had to do what not many Superintendents can, or will do: I had to pass off the cultivation of our putting greens to Jim, Dan and Jake. 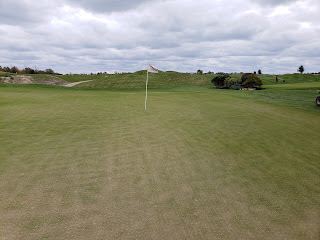 I had not stepped foot on our greens in days, and yet everything was perfect; holes punched and plenty of topdressing down; a supremely successful aeration! Well done gents! 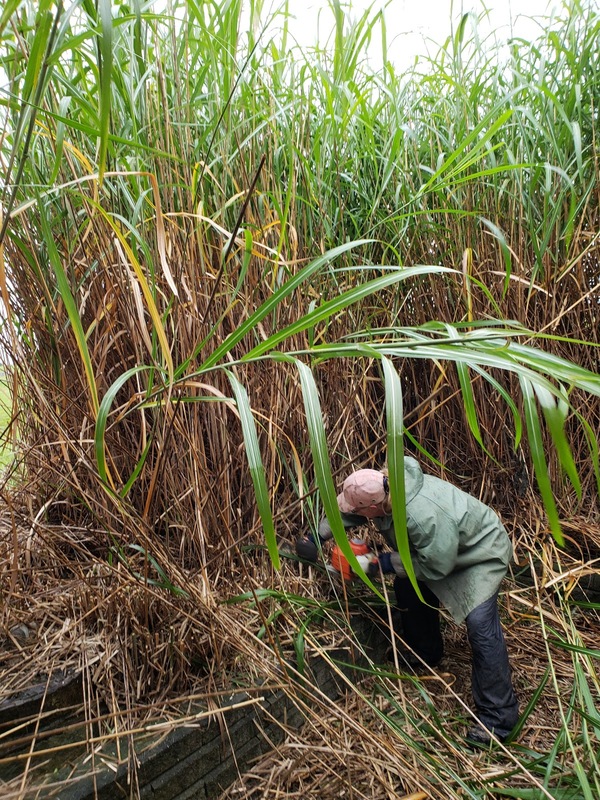 Meanwhile, Shelley, Lena and Ruth tackled something that had not been touched in 5 years; the bamboo around the pumphouse. What a jungle! We have been blessed on the crew to see the arrival of our newest member; Sasha. He joined us on Labour Day to patrol the grounds, assist with the removal of geese, and to provide a morale boost to everyone on the crew. So far, he is batting 1.000! Sasha is a Gerberian Shepsky; a half German Shepard and half Siberian Husky. He has done remarkably well thus far, and is extremely obedient. He is still learning however, so I apologize in advance if the puppy in him momentarily takes over...he is after all only 15 weeks old! 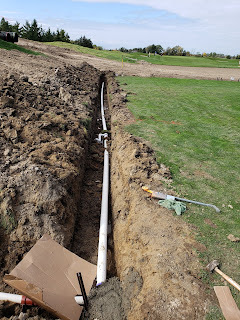 The winterization of the irrigation system is slated to begin on October 22nd, and will run for two days. We are still tackling the annual cultivation of the natural areas, and will continue to do so over the coming weeks. 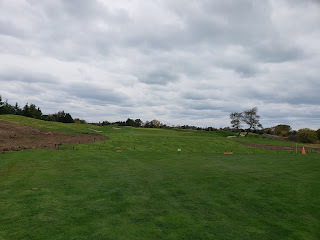 We still have significant cleanup to do on #10, and hope to have it all buttoned up by mid-November. It is also of course that time of year when we unfortunately have to say goodbye to some of our seasonal staff. Last week, Randy finished his second season on our crew, and today we said goodbye to Tyson following his third season on the crew. Both of these gentlemen were considerable assets to us on the Turf Team this season. Thank you both! 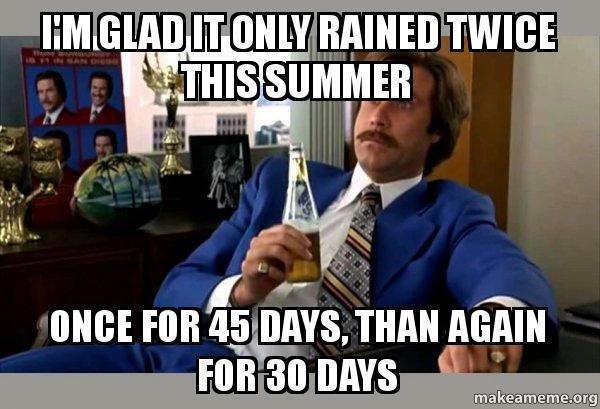 A bit of a stretch I know, but it certainly feels as though it has rained all summer! The dry spring is long but forgotten as we deal with the frequent rains of the past 6 weeks. The golf course is incredibly saturated. I cannot recall in the past 10 years the course holding water as much as it is at this time of year. The challenge of course is in the attempts that we must still make to maintain the golf course despite the rain. Grass certainly does not stop growing, and we have to find ways to get things done - albeit not as cleanly as we would like it to be. 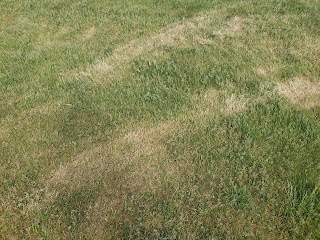 The photo above is of the 8th fairway and the damage being incurred by traffic (both golf carts and grounds machinery). This is just a glimpse of the many soggy areas found on the golf course. 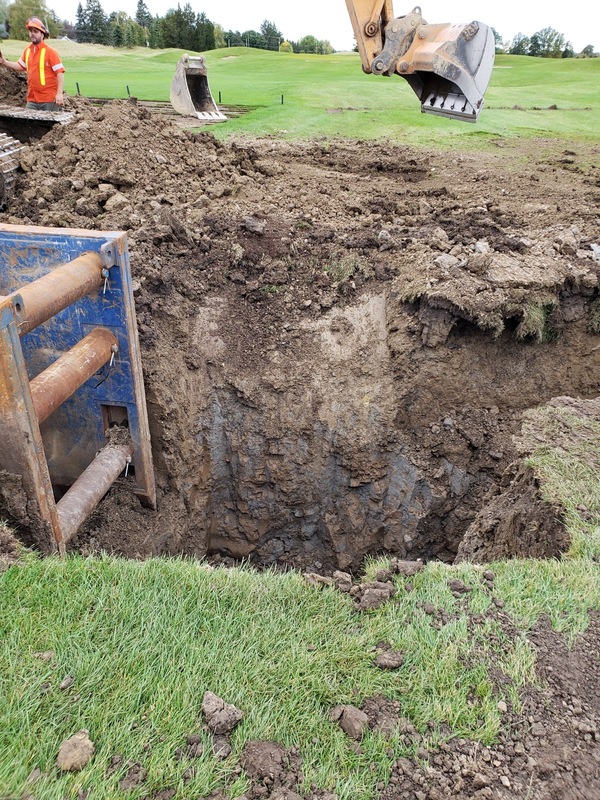 We have installed some signage in certain areas - such as 10 fairway - in an attempt to minimize damage as we continue to experience wet conditions. Thank you for your help in adhering to these directional signs. On a side note, I would like to ask for your cooperation with garbage disposal on the golf course. 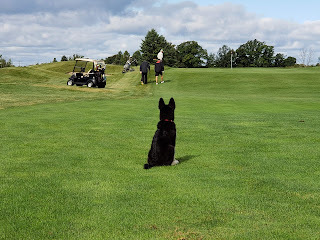 It has become common practice for golfers to simply drop their empty cans and garbage at a tee stone, and not in the receptacles. 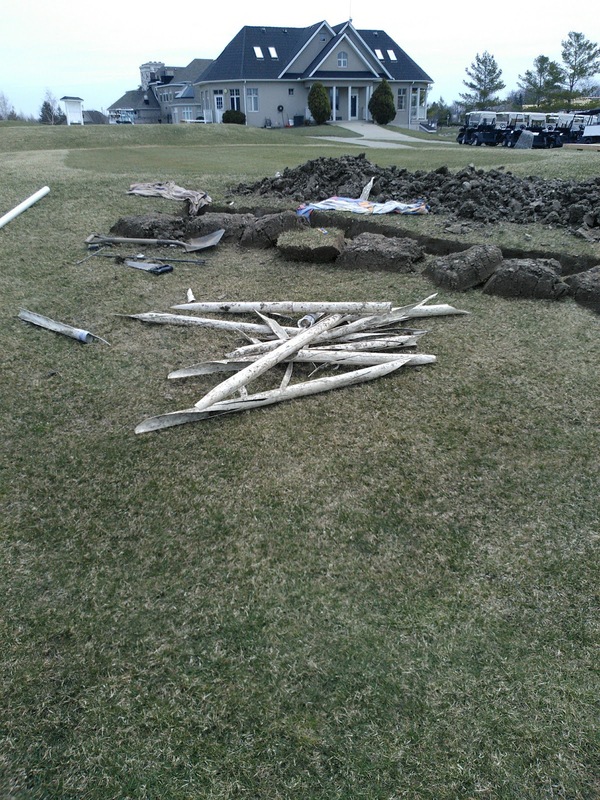 At the onset of the golf season, we made a switch to using centralized garbage stations as a result of reallocating Turf Team labour. With that change we no longer specifically spend labour hours on garbage collection daily, and empty the receptacles only a couple of times per week. This means that the garbage being dropped on the ground, will either blow away in the wind, or sit at these stones for days on end. This of course is not the look or reputation that you or I are trying to achieve for Sawmill Creek. 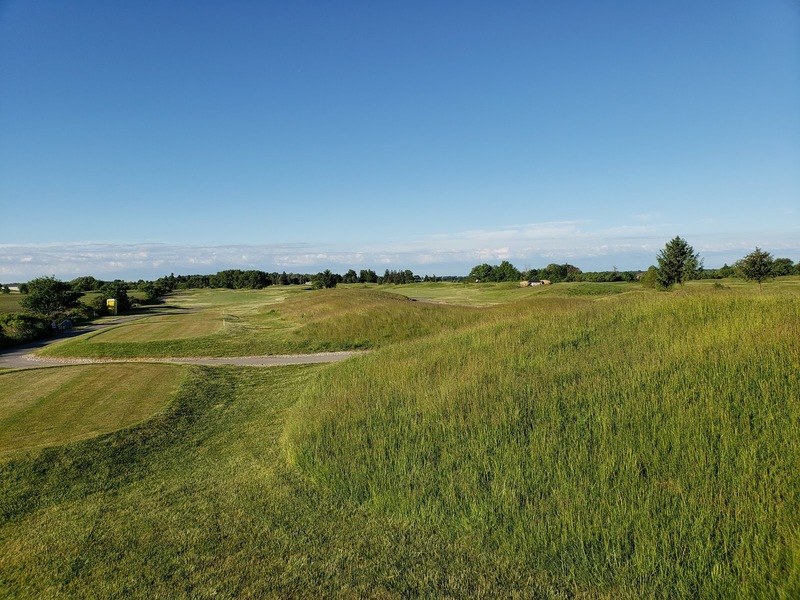 Please help us all out by utilizing the garbage stations located on the course, and allow the turf team to utilize their time on productive tasks such as keeping our playing surfaces pristine. The Turf team thanks you for your cooperation. 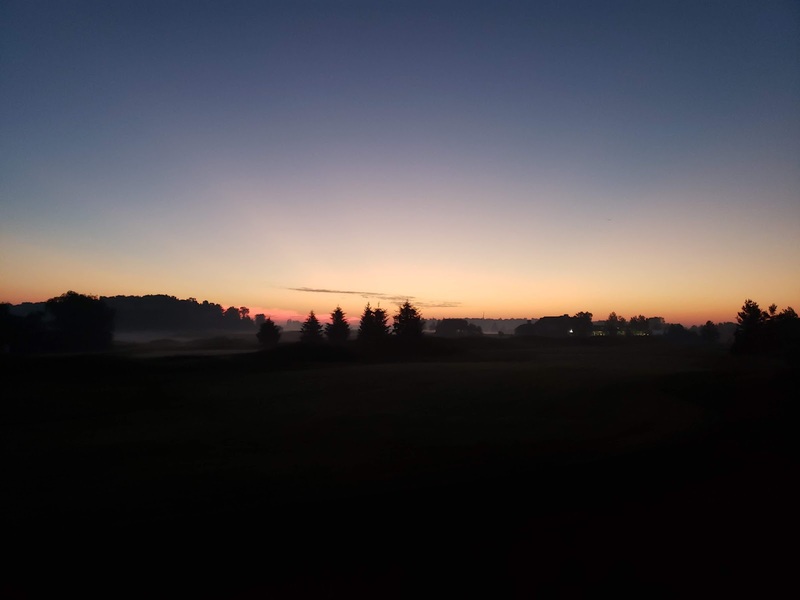 August has arrived - always a joyous occasion for the turf professional as the days become shorter and the finish line starts to appear on the horizon. It is not said to wish time away, but intended as the joy that a marathon runner feels when they see the finish line - pride of accomplishment but still an overwhelming feeling of exhaustion. It is easy to forget during extended weather periods such as what we are in right now, just how dry it was early in the season....fortunately we have this blog to remind us! 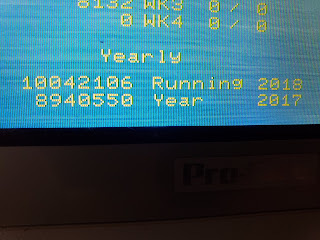 Bearing in mind that we have not had to run any irrigation cycles whatsoever in more than two weeks, we have still surpassed - this season - the total amount we used in all of 2017....a staggering statistic when coupled with the fact that we did so shortly after July began. Which brings me to the question which has been posed recently as to why all of this wet weather has not resulted in our irrigation pond level rising. During the period of July 16th to the 30th, we experienced close to 70 mm of precipitation. These rain events occurred over several days, and were never much hindrance other than to keep everything growing hard. With the ground having been as dry as it was in the previous months, it simply absorbed all it could get, resulting in very little run off. That run off is what typically refills our pond which has now resulted in its level remaining relatively flat. 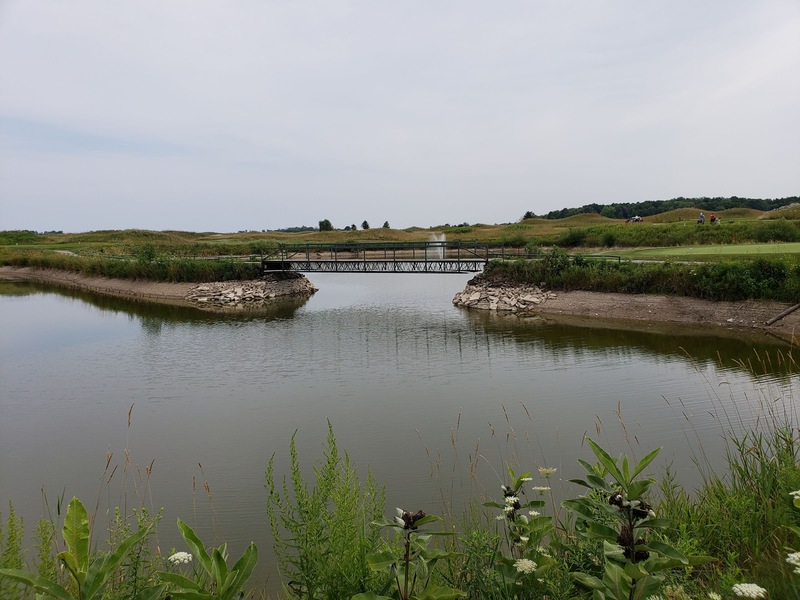 With all of our storage ponds at, or near capacity and the calendar flipping into August, I am confident that we have more than enough water to get through the season, even should the tap in the skies shut off. This is also a great time to point out just how great our greenside bunkers are performing after our renovation in 2016. They are passing the wet weather test with flying colours! Kudos to Dan W for the beautiful job he does at bunker setup each and every time he is out there. As is the primary topic of this blog, let's talk weather. It has been, and looks to continue staying hot for the foreseeable future. I love the photo taken the other day from the shop....almost like an oven preheating; which as you all know has been the case lately. 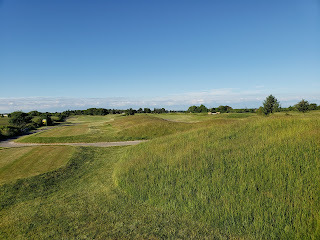 The course is handling it marvelously thus far, although it is always a guessing game as to how long it will hold on. These are extreme temperatures for cool season grasses to thrive in - especially the high overnight temperatures. The high dew points may make irrigating easier - or absent as has been the case - but it also creates a petri-dish of potential fungal activity. 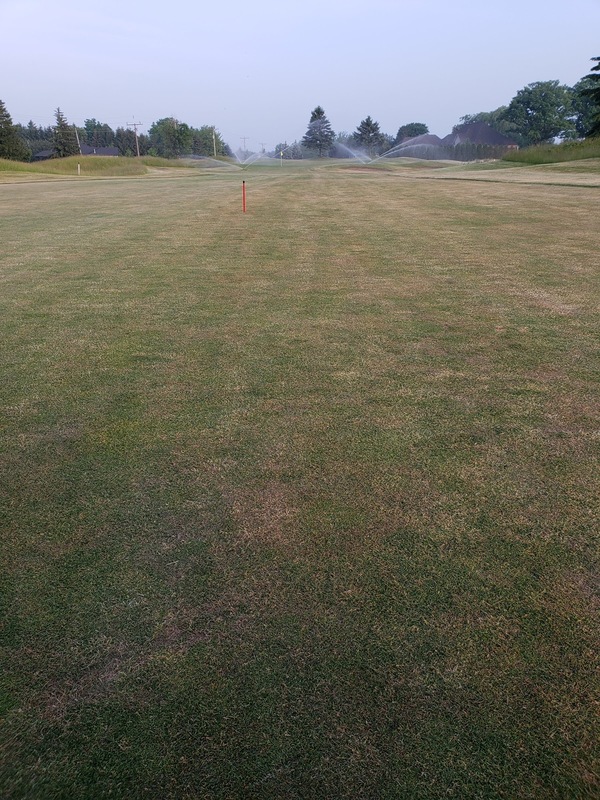 Dollar spot is certainly taking hold in our fairways and tees, with the pressure mounting on our putting surfaces. It should be an interesting ride over the coming weeks as summer rolls along. Clover has been quite active over the past month, with only the back nine having received any treatment so far. The control has been marginal, but has at least knocked the flower head back. The front nine will be taken care of as soon as possible. Thank you to the many who have flagged down our staff lately with compliments and praise. It goes a long way in keeping the motivation for many of us during these grueling summer days, and is nice to know that our efforts are appreciated. Thank you! We are going through our water reserves at a steady pace. 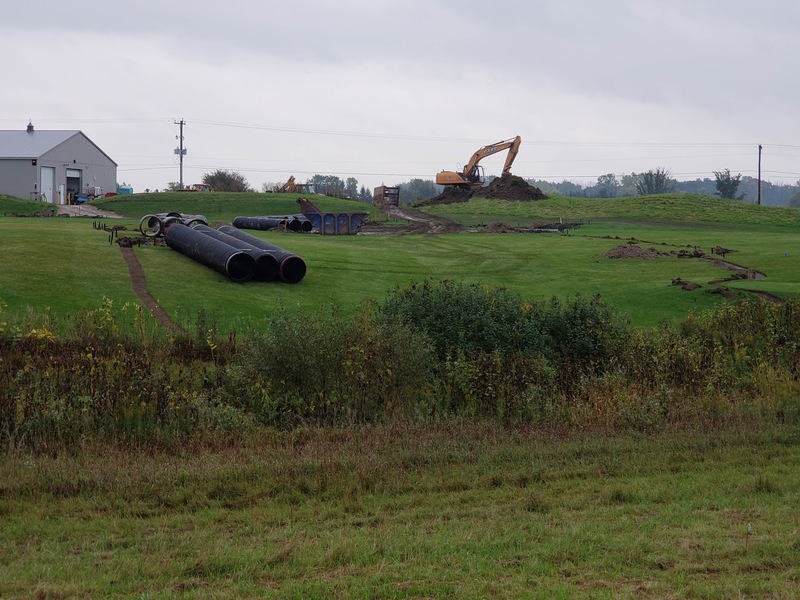 With one pond already emptied, and another well on its way, water conservation will become a topic of conversation very quickly here. The lack of humidity, steady winds and high skies have all contributed to very high evapotranspiration rates. 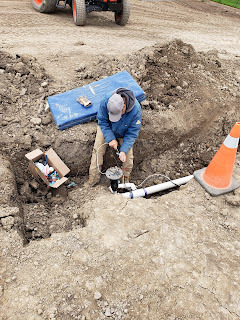 This means that the turf plant is requiring a lot of water right now to sustain health at the moment, and if an issue is encountered, it makes it very difficult to play catch-up. This is the exact scenario that we are faced with on holes 11, 12 and 14 following an electrical issue with our control system. 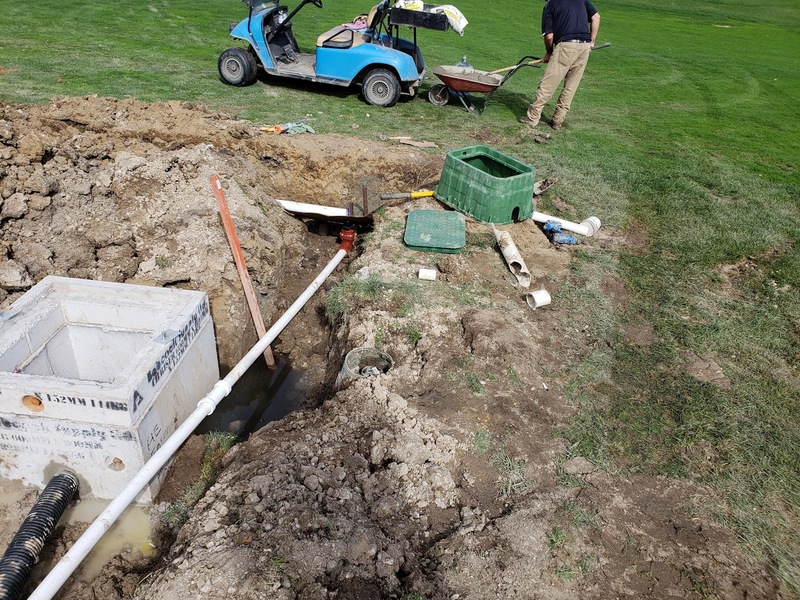 It just so happens that this satellite controls more than 100 sprinkler heads (by far the most on the golf course), making it very difficult to compensate for the breakdown we experienced. We have been fortunate to have had low overnight temperatures which has prevented this from becoming a larger issue than it has already been. 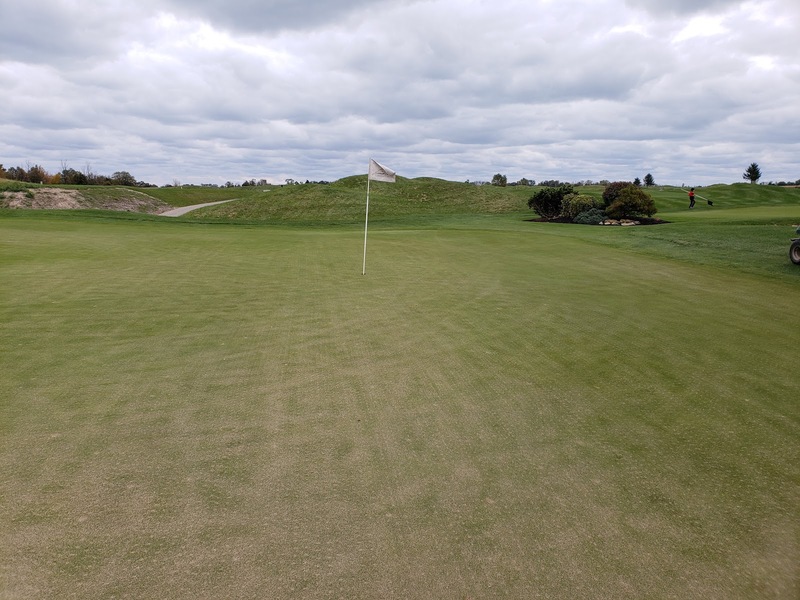 With this week's topdressing of our greens, it has been nice to see a return of our great putting surfaces. Speed has picked up, as has ball roll, which has been noticed by many. Thank you all for your positive words of encouragement. 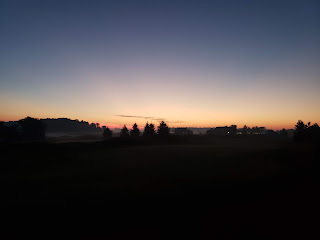 Weather is always the hot topic of these blog posts and is the single greatest driver in relation to course conditions. Over the years’ I am sure you have heard many an explanation for course conditions based upon weather, as we have attempted to keep you informed on the state of the golf course. Today’s post will be no different…. The up and down roller coaster that we have been riding for the past 4-6 weeks has left both the turf and myself confused as to what is truly going on in the ground. 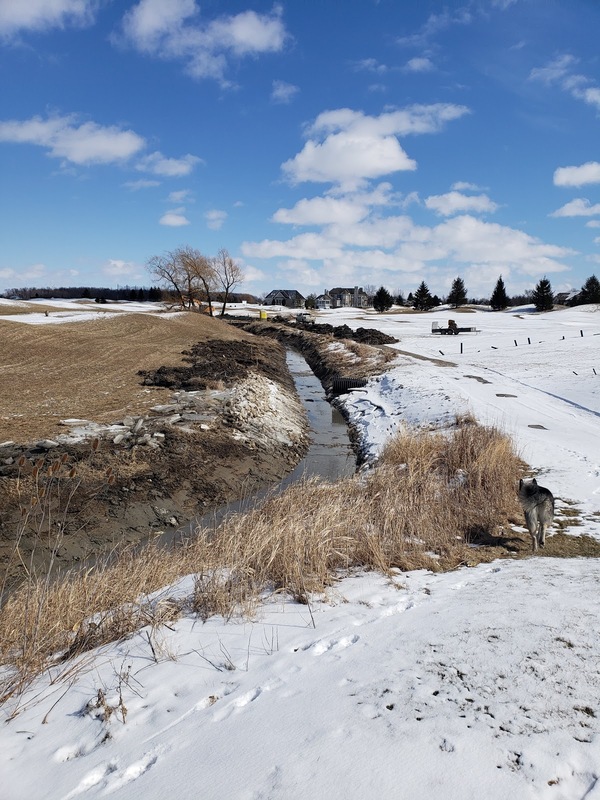 We have been dry in comparison to neighboring communities, but have also been dealing with extreme weather swings as a result of wind direction. I have lost count of the days now in which the rest of the province is dealing with hot and humid temperatures, while that north wind keeps us right around the 10 degree Celsius mark. With a quick shift in the wind we skyrocket into those extremes, or can plummet just as fast. Confusing to golfers who never know how to dress for their round, but also confusing for the turf which cannot seem to get settled in any way. A great example of this is shown in the picture above. 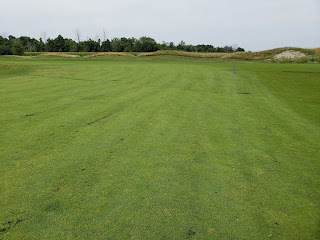 During the hot, dry and windy spell of last week, the turf was doing all it could to hang on, having not been accustomed to the stress of heat and wind that it was experiencing. In what would be considered a routine practice, the simple act of vehicle traffic proved to be too much for this particular spot and the tires left damage to the frail turf plant. This is just a small example of how these temperature fluctuations can impact turf quality. Taking this into account on a larger scale, imagine the stress being induced during the act of mowing. At the time of this heat wave we were still attempting to get control of turf that was growing at a very rapid pace – it was spring after all and we all know how fast turf can grow. Cutting more than 1/3 off of a plant is never ideal, let alone doing so in the middle of a heatwave, but this is exactly where we found ourselves last week in trying to stay on top of it. This has left some fairly brown looking turf, or “linksy” as one member put it. 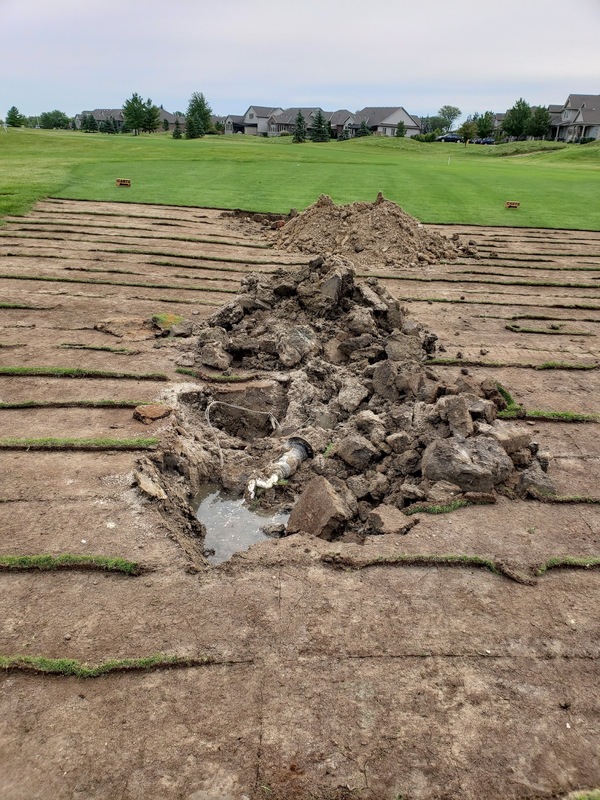 Perhaps not what we are all accustomed to, but a result of weather patterns and vital maintenance on our behalf. 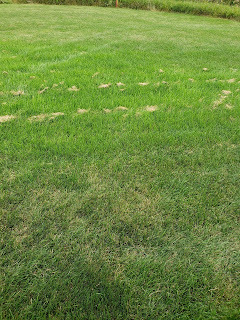 Summer weather will arrive eventually and should bring some stability to our turf and its performance. Steady temperatures and a little more moisture will help with consistent playing conditions. Until then, enjoy the challenge of never knowing what you are going to get! Oh, and make sure you keep that sweater handy…..and the sunscreen......(and maybe the parka today). · Patience is key, I assure you the greens are not dead despite their white/yellow appearance. And as per the norm, all of the above is true once again in 2018! I encourage you to continue to provide us with feedback with regards to the changes we have implemented this season. I have had conversations containing mixed feelings from some of you, but the only way to truly understand how these changes have been received, is to contact me directly. Feedback can be a gift if given and received in an effective manner and I encourage you to let me know where you stand. 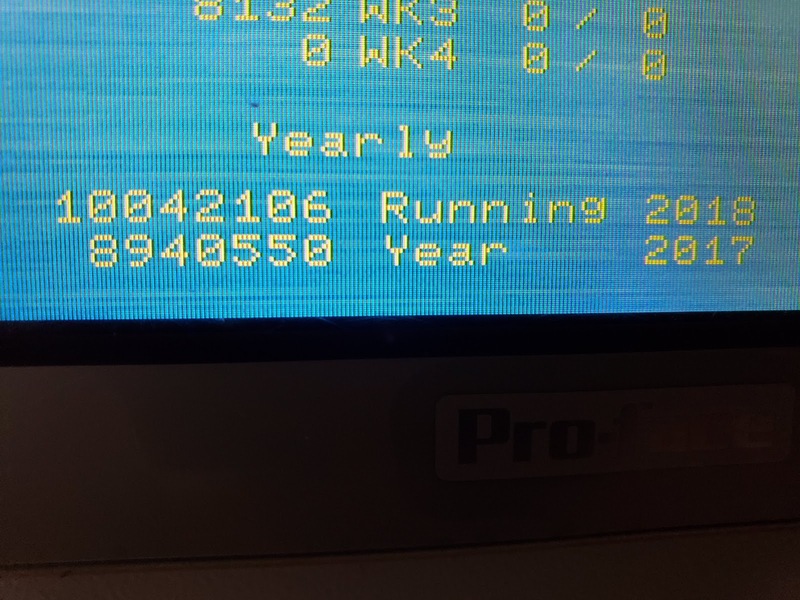 The irrigation system is alive and well, with only one major line break as a result of the winter season. This of course was right at the first tee but has been buttoned up nicely by the crew. With the system entering its 25th season of operation, we naturally incur electrical issues usually caused by the many rodents that call Sawmill Creek home. If you encounter a rogue sprinkler head which mysteriously turns on and off real quick, with no staff in sight, chances are we are having some sort of mouse induced electrical problem. Please let the pro shop know as soon as you can, and they will contact me to let me know. Finally I will ask you all again this season for your cooperation in keeping our staff safe. We have already experienced several near misses this season with respect to golf balls and staff, and I ask that you please ensure that if you are in the vicinity of working members of our team, you please make sure that they are aware of your presence. A simple wave will suffice and grab the attention of our team members letting them know that you are ready to hit. Golf balls acting as projectiles have the ability to injure and harm our team members. Please respect their safety at all times, allowing them to return home in the same condition in which they arrived. Our families thank you for your respect.